Igor Kaczmarczyk, the laureate of the 1st edition of ADAMED SmartUP programme, has been awarded with one of the main prizes in the 28th edition of the European Union Contest for Young Scientists (EUCYS 2016). Together with Jadwiga Czyżewska and Maciej Mańka, he will represent Poland in the final of the competition in Brussels. “Amber Drug. 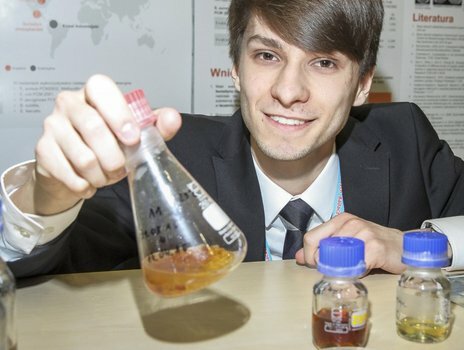 A study of the antibacterial action of extracts of fossil and subfossil resins and 1,4-butanedioic acid on selected microorganisms” revealed that an active substance retrieved from amber could be able to fight off pathogenic bacteria, for example those causing staphylococcal malignant infection, without harming “good” intestinal microflora. The European Union Contest for Young Scientists has been organised by the European Commission since 1989. The main participation conditions comprise remarkable achievements in national Olympiads and interest in exact, life, technical, economic and social sciences. During the 28th edition, the authors of the top three works were selected to represent Poland in the final of the competition in Brussels. Igor Kaczmarczyk, laureate of the 1st edition of ADAMED SmartUP programme, was among them. In the last year’s edition of the competition, held in Milan, the project of Michał Bączyk – laureate of the grand prize in the 1st edition of the ADAMED SmartUP programme – and Paweł Czyż was awarded with one of the top three prizes, namely 7 thousand euro and also an honorary prize: an invitation to participate in the International Youth Science Forum 2016 in London, UK. The young scientists studied the behaviour of single and coupled on-off type oscillators on the example of a bottle oscillator, made out of bottles joined by pipes. We would like to warmly congratulate the laureates of ADAMED SmartUP on their achievements and encourage other young scientists to develop and participate in the next edition of the programme and to make use of educational materials – videos and articles prepared by the lecturers of the ADAMED SmartUP programme. You may find them here.